Helical Tieback Anchors are used to reinforce and anchor retaining or basement walls damaged by lateral loads from earth and water pressure. Since the 1950-s, the Chance Company has been manufacturing multi-helix screw anchors. These anchors have established a consistent record of performance through extensive use in the tieback, electric-utility and petroleum industries. Construction applications for screw anchors in retaining-wall tiebacks continue to grow. The screw anchor's advantage is how it removes the performance uncertainties and costs associated with a grouted anchor when used in loose sandy soils and low-shear-strength clay soil. When placed in the soil, the screw anchor acts as a bearing device. This is a fundamental difference compared to a grouted anchor formed in soil and reliant on friction between the soil and grout. 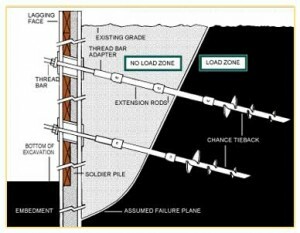 Collapse of a prepared hole can change a grouted anchor's dimensions. This leaves little opportunity to assess the problem's magnitude and exact location. To protect grout from such an occurrence adds the extra costs of installing casing. A screw anchor averts these drawbacks by requiring neither an open hole nor a casing. Installation torque limitations may preclude the application of screw anchors in some extremely-dense soils. 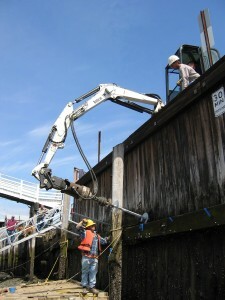 Torque-monitoring during screw-anchor installation provides a means of quality control. It can disclose valuable information where subsurface conditions vary significantly from those anticipated. Click on tieback anchors project to view our project using this tieback anchor method. May be installed with conventional rotary drilling equipment used in grouted-anchor tieback construction. Faster to install. No drilling or spoils removal. Typical installing time is 20 to 30 minutes. Immediate testing following installation since grouting is eliminated. Monitoring torsional resistance during installation gives an indication of encountered soil parameters that can relate to anchor load capacities and help prevent overstress. Screw anchors can be withdrawn and reused. 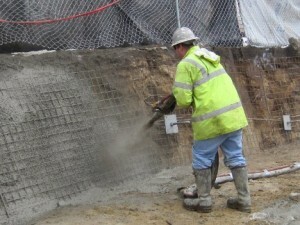 The CHANCE® Soil Screw® Retention Wall System reinforces the earth to construct gravity walls, an efficient and economical system to retain soil during excavation and construction of structures. In this "soil nail" application, a Chance screw anchor acts in a bearing mode compared to grouted anchor, which relies on friction. 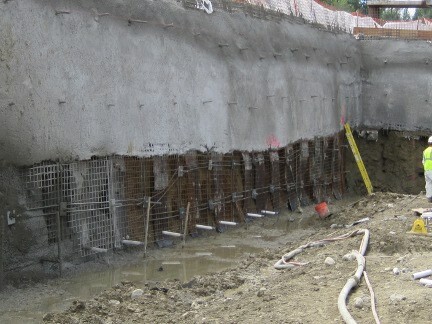 This gives the Soil Screw Retention Wall System economic advantages. Bearing plates are spaced along the entire length of Soil Screw anchors. They are ready for immediate loading as soon as installed. Backhoes and skid-steer loaders can quickly rotate Soil Screw anchors into place. Anchor size and grid spacing are designed to local soil conditions and load requirements. 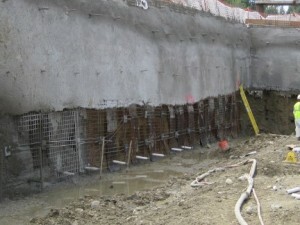 A reinforced-shotcrete veneer often is applied to the wall face. If your seeing signs of bowed or cracked walls, that is a good indication of foundation settling or wall is too weak to support the load behind it and needs to be addressed. Or, if you need assistance in shoring your project with the help of our excavation support anchors, please use our form to contact one of our helical pile installation specialists to guide you to the right solution.